I have been thinking about spring a lot lately (or actually pretending it is spring would be more accurate). I read a great post on how to wear coral over at Polyvore. According to them (and I quite agree), coral is going to be a key color to incorporate into wardrobes this spring season. Mix it with neutrals like grey and beige for a soft look, or bold by mixing in brights and metallics. Feathers are a whimsical trend that hit this year. 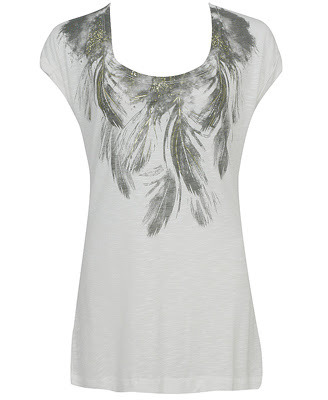 I love this casual top with contrast feather print and metallic accents. 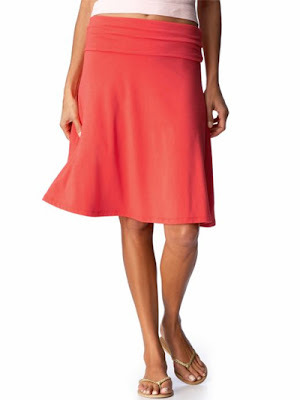 A soft jersey skirt with comfortable foldover waist makes for a refreshing alternative to jeans or shorts. I want to buy one in every color and wear them for the rest of spring / summer. 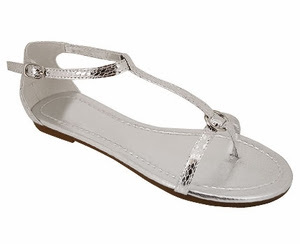 These sandals are a nice comfy alternative to the ON flip-flop that I usually spend my summer in. T-Strap sandals are one of my favorite trends this season and come in a variety of styles. I love this outfit. And I love the fold over skirt - it was a staple when I was pregnant since it would fit over my belly as it grew. I think I'm going to go get one - I love skirts for the spring and summer. Excellent point about this skirt being a great maternity (and probably post-maternity) option. It's available in 6 colors too! i could live in a skirt like that!